Functionality noted in this topic is available to targeted users as part of a private preview release. The content and the functionality are subject to change. You need to enable automated Entity store refresh before enabling Data Lake integration. Go to System administration > Set up > Entity store. On the Entity store page, a message indicates that you can switch to the Automated Entity store refresh option. This option is managed by the system. An admin doesn't have to schedule or monitor the Entity store refresh. In addition, an admin can refresh any aggregate measurement on demand by selecting the Refresh button. Additional options will be added in future platform updates. These options will include options for real-time refresh. When the automated refresh is enabled, in some cases the system may disable refresh of Aggregate measurements. You must revisit aggregate measurements and validate that appropriate refresh intervals have been applied by the system. This restricted feature is turned on via flighting. This feature is available only if your environment is included in the flight. When this feature is turned on, Entity store data isn't populated in the relational Entity store database in the Microsoft subscription. Instead, it's populated in an Azure Data Lake Storage Gen2 account in your own subscription. You can use the full capabilities of PowerBI.com and other Azure tools to work with Entity store. Before you start, you must complete these tasks in the Azure portal. Create storage accounts. Provision a storage account in the same data center where your Microsoft Dynamics 365 for Finance and Operations environment is provisioned. Make a note of the connection string for the storage account, because you will have to provide it later. Create a Key Vault and a secret. Provision Azure Key Vault in your own subscription. You will need the Domain Name System (DNS) name of the Key Vault entry that you created. Also add a secret to Key Vault. As the value, specify the connection string that you made a note of in the previous task. Make a note of the name of the secret, because you will have to provide it later. Register the app. 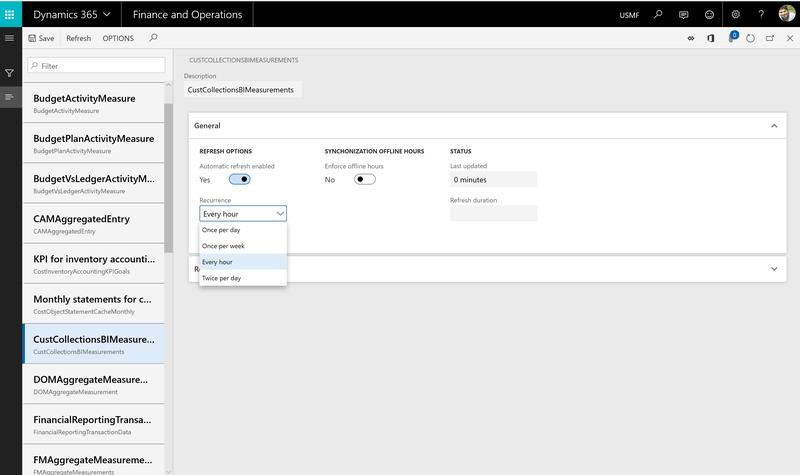 Create an Azure Active Directory (Azure AD) application, and grant application programming interface (API) access to Key vault. Make a note of the application ID and its application key (secret), because you will have to provide them later. Add a service principal to Key Vault. 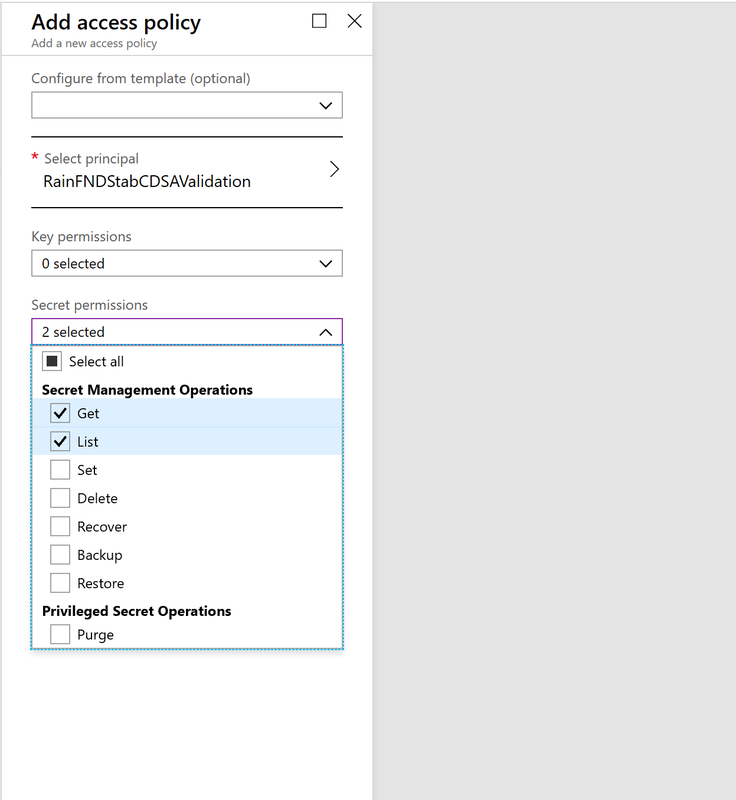 In Key Vault, use the Access policies option to grant the Azure AD application Get and List permissions. In this way, the application will have access to the secrets in Key Vault. The following sections describe each task in more detail. In the Azure portal, create a new storage account. Location: Select the data center where your Finance and Operations environment is located. If the data center that you select is in a different Azure region, you will incur additional data movement costs. If your Microsoft Power BI and/or your data warehouse is in a different region, you can use replication to move storage between regions. Performance: We recommend that you select Standard. Account kind: You must select StorageV2. In the Advanced options dialog box, turn off the Data Lake storage Gen2 (preview) option. This will be made available in a later update. Until then, you can't consume data by using Azure Data Lake Storage APIs. If you aren't part of the preview program for Data Lake Storage Gen2, you might not see the Data Lake storage Gen2 (preview) option. Select Review and create. When the deployment is completed, the new resource will be shown in the Azure portal. Select the resource, and then select Settings > Access keys. Make a note of the connection string value, because you will have to provide it later. In the Azure portal, create a new Key Vault. In the Create key vault dialog box, in the Location field, select the data center where your Finance and Operations environment is located. After Key Vault is created, select it in the list, and then select Secrets. In the Create a secret dialog box, in the Upload options field, select Manual. Enter a name for the secret. Make a note of the name, because you will have to provide it later. In the value field, enter the connection string that you obtained from the storage account in the previous procedure. Select Enabled, and then select Create. The secret is created and added to Key Vault. In the Azure portal, select Azure Active Directory, and then select App registrations. Name: Enter the name of the app. Application type: Select Web API. Sign-on URL: Copy the root URL for Finance and Operations, and paste it here. After the application is created, select it, and then select Settings. Select the Required permissions option. In the dialog box that appears, select Add option, and then select Add API. In the list of APIs, select Azure Key Vault. Select the Delegated permissions check box, select to grant permissions, and then select Done to save your changes. On the Application menu of the new app, select Keys. In the Key Description field, enter a name. Select a duration, and then select Save. A secret is generated in the Value field. Immediately copy the secret to the clipboard, because it will disappear within one or two minutes. You will have to provide this key to the application later. In the Azure portal, open Key Vault that you created earlier. Select Access policies, and then select Add to create a new access policy. In the Select principal field, select the name of the application that you previously registered. In the Key permissions field, select Get and List permissions. In the Secret permissions field, select Get and List permissions. Go to System administration > Set up > System parameters. Application ID: Enter the application ID of the Azure AD application that you registered earlier. Application Secret: Enter the application key (secret) for the Azure AD application. DNS name: Enter the DNS name of Key Vault. Secret name: Enter the name of the secret that you added to Key Vault together with connection string information. 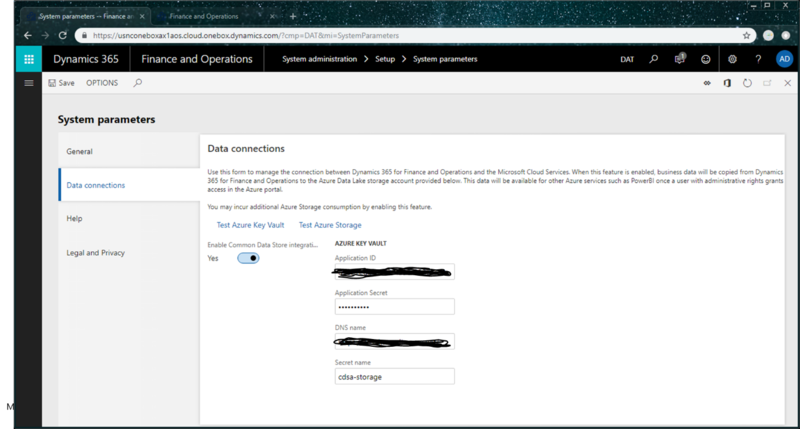 Select the Test Azure Key Vault and Test Azure Storage links to validate that system can access the configuration information that you provided. Select the Enable data connection check box. Entity store data should now be populated in the storage location that you provided, not in the relational Entity store database. The aggregate measurements and refresh options that you select in the Entity store UI should now apply to data that is copied to Data Lake.